look for a low end price! Before I started blogging and sharing our crazy home DIY’s with the internet world… we took our kitchen from 1970 scary to, well… better. I thought I’d share a bit of our kitchen journey with you all. I’ve posted here and here and here about the first seven steps in transforming your kitchen to have a high end look at a low end price. 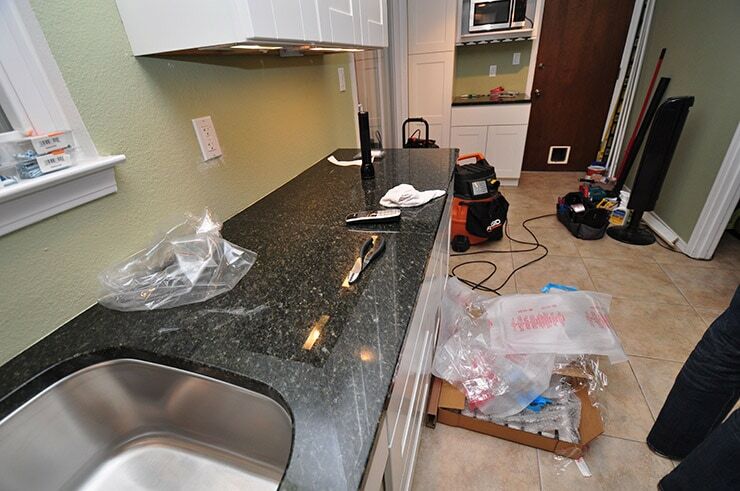 The hubs and I were expecting our first baby and as any normal couple who are preparing to take on that huge responsibility of parenthood and make major life changes would do… we decided it would be an ideal time to completely gut and renovate our kitchen. This was our kitchen for many years (5+ years). This picture was taken shortly after we moved in. Sometimes I wonder why we bought this house when I look back at the early pictures. Lots of dark original to the house cabinetry, fake butcher block counter tops, odd textured stripe wall paper, and a single large florescent light overhead. Oy. Step 7 Do. It. Yourself. So, we left off on the last post with my baby bump growing leaps and bounds, our entire kitchen being texturized (a true polar vortex) and having to throw out every single item in our refrigerator when the hubs forgot to plug it back in. 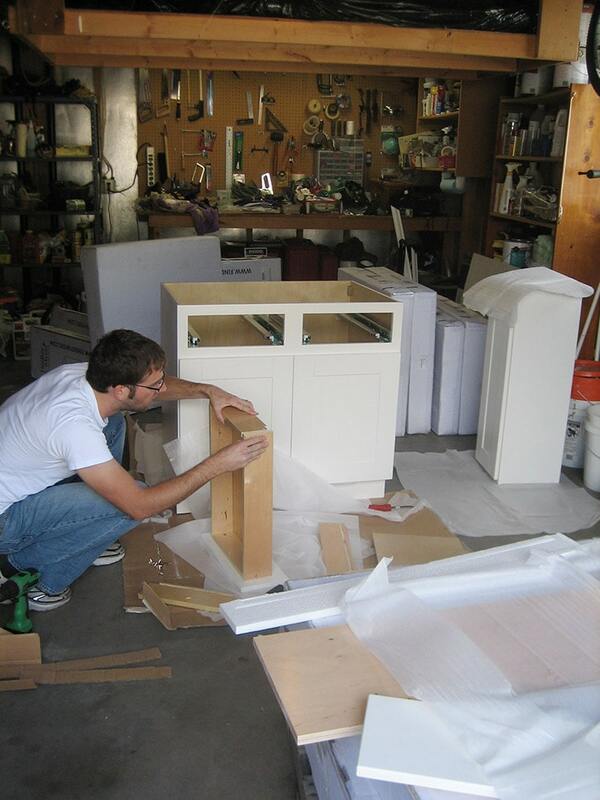 Meanwhile, the hubs was slowly but steadily putting all the Cabinet To Go cabinets together. (major love sent their way, see this post). 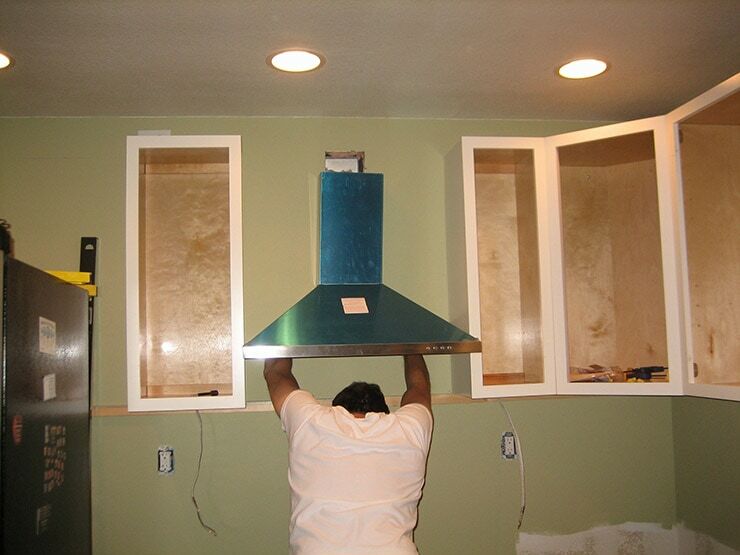 His method was installing the upper cabinets first in our garage. Then, depending on how heavy it was, he’d muscle it into the house or I’d do some very minor assistance to get it around a corner and into the kitchen. Step Eight is watching lots of This Old House on Youtube. I tried finding the T.O.H. video with this next tip, but couldn’t… and I’m probably going to call it the wrong name. 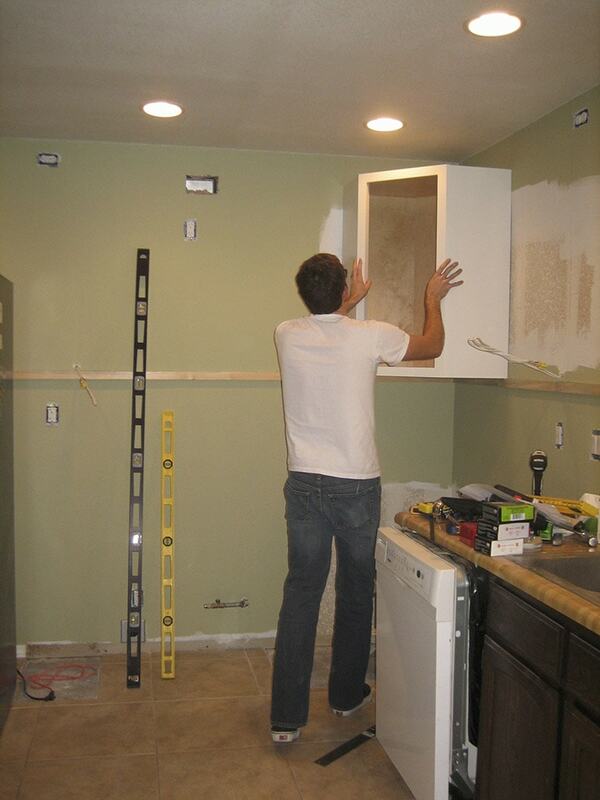 BUT, it was a major help to measure the height of the bottom of the upper cabinets and then the hubs installed a small wood strip all along the wall. This helps as you hold those HEAVY cabinets up, so they can be kind of propped up and you can just use one hand. As I mentioned, the hubs does lots of pondering and there is no way he could ponder and hold at the same time. Step Nine is buy appliances on SALE and buy fixtures on the CHEAP. We had a functioning dishwasher, oven, etc… but just wanted stainless steel. So, with no major rush on our hands, we were able to wait for those great sales on those items. For all our fixtures, we also took our time and found amazing options for a fraction of the cost. Good ole’ trustworthy Sears was our go-to appliance store. Our range hood is a beauty (it’s not blue, thats the protective covering) and we got her at Costco. Our sink faucet is so lovely and we got that at Costco, too. All our cabinet pulls + knobs and under cabinet lights were an Amazon online find. 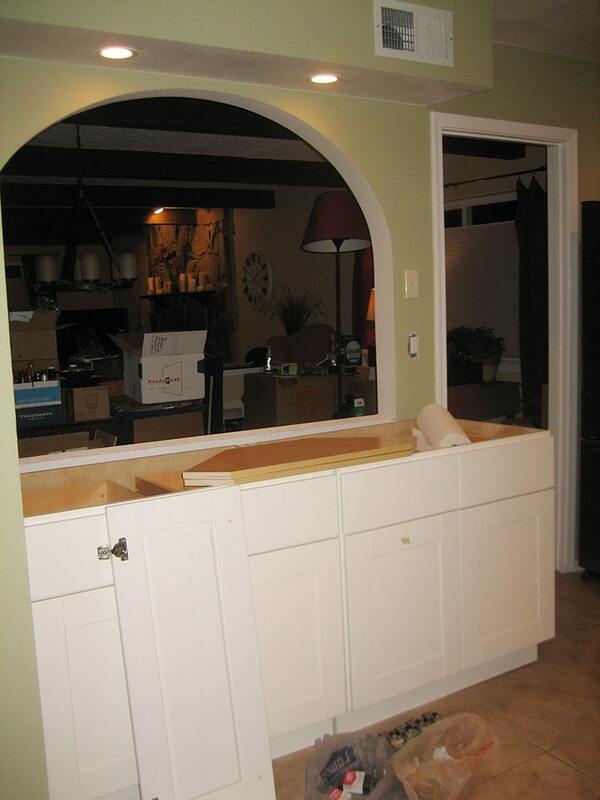 After the upper cabinets were all up, we (the hubs) started on the lower ones. Can you believe it? It’s starting to look like a kitchen again! We had crazily agreed to host Thanksgiving at our home for my entire family and the hubs was connecting the dishwasher while I picked everyone up from the airport. We didn’t even know how to work our oven to cook the turkey the next day. So many learning lessons, folks! 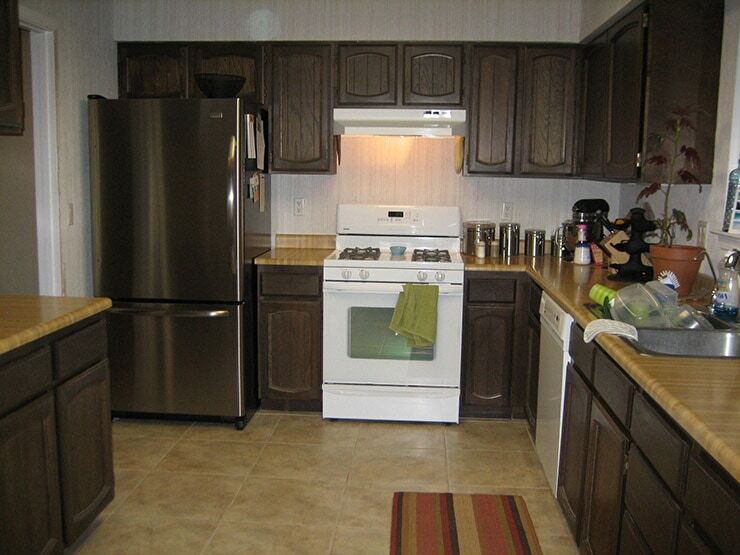 But, the kitchen renovation was complete, excluding the backsplash. We were so thrilled to have a functioning kitchen again. A little bit later (ONE month and a few days, to be exact) we welcomed sweet little kiddo #1 to our family and things like kitchen backslashes took a major backseat…. for a while. 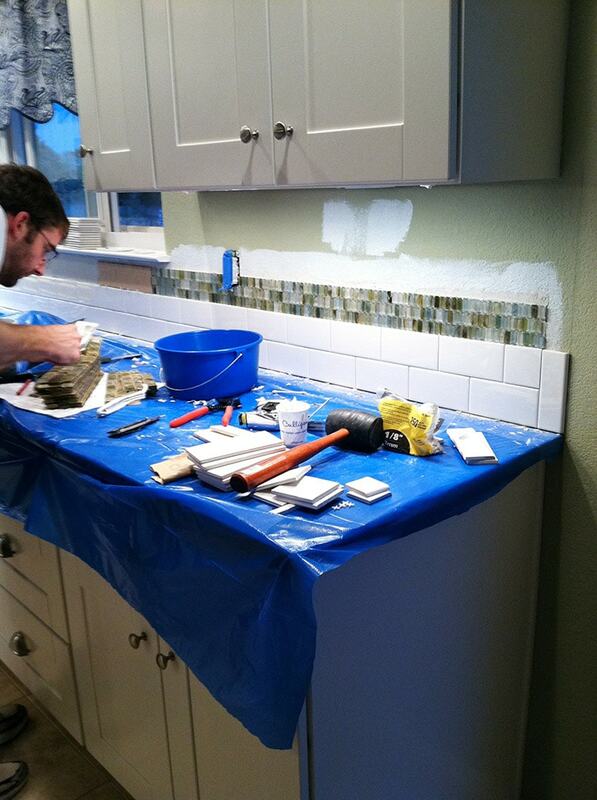 Fast forward about 10 months and we were ready to tackle the FINAL item, the backsplash. Step Ten and my final tip for renovating your kitchen for less is, know when to splurge and when to skimp. I had dreamed about all white Moroccan tiles or small diamond shaped marble tiles and while all of those are insanely stunning, they are insanely expensive. We decided to go with simple (and CHEAP) white subway tile from Lowes and then do a small accent strip with small glass colored tile. No surprise to anyone who has been reading this mini series, but we saved a substantial amount of money by installing the backsplash ourself. I’m sure for someone who is a tile master, this is not a huge task. But it was our first tile job and there were areas with numerous tile cuts and those glass tile were TINY. I think we spent a total of 40 hours spread out over evenings and weekends of a week or two. This concludes my kitchen renovation for less mini series! It was a long ride from start to finish for us to transform our kitchen and I thank you for sticking with me on FOUR parts to this series. I hope you all were able to gain a little bit of insight for any potential kitchen updates you may have planned. Update: To see previous posts, I’ve posted here and here and here about the first seven steps in transforming your kitchen to have a high end look at a low end price. 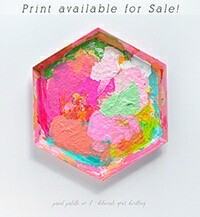 I know I posted earlier this week but I wanted to let you know, we are featuring you on Craft Frenzy Friday this week. :o) Please, stop by an grab a featured button to show off. We drawing near to the day when the kitchen will be the last space in the house that needs renovated. Not looking forward to it. Yours looks gorgeous. Great job! Love this redo, Amy! I featured it for this week’s Create & Share that goes live at 6pm PST! I can’t wait to see what you’ve got going this week! I’m dying laughing that you guys were plugging in the dishwasher while picking up relatives for Thanksgiving dinner. Totally something I would do. Like last Easter when I agreed to have an egg hunt at our house when our floor was only halfway installed. Ha! Love the final kitchen, Amy! It is so gorgeous and totally worth all the DIYing you put into it. Wow, looks great! 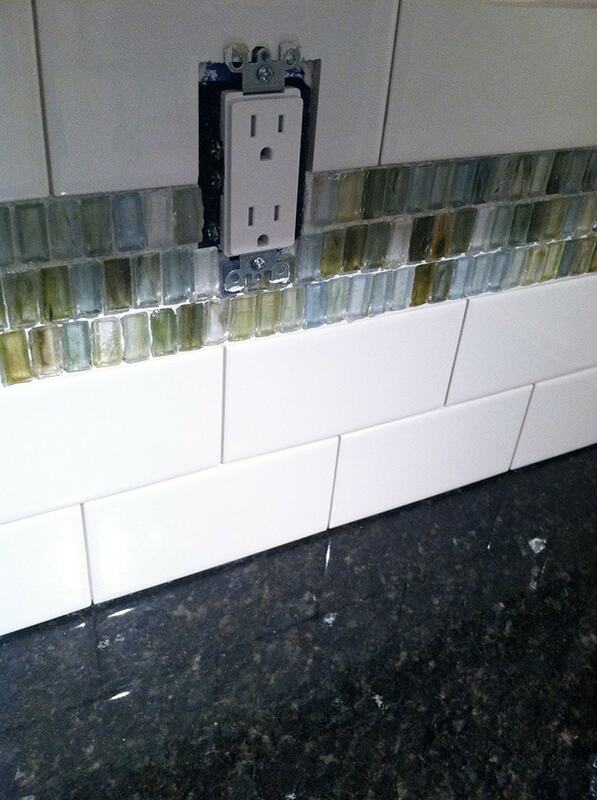 Love the glass tile that you chose, everything looks amazing! Absolutely beautiful! 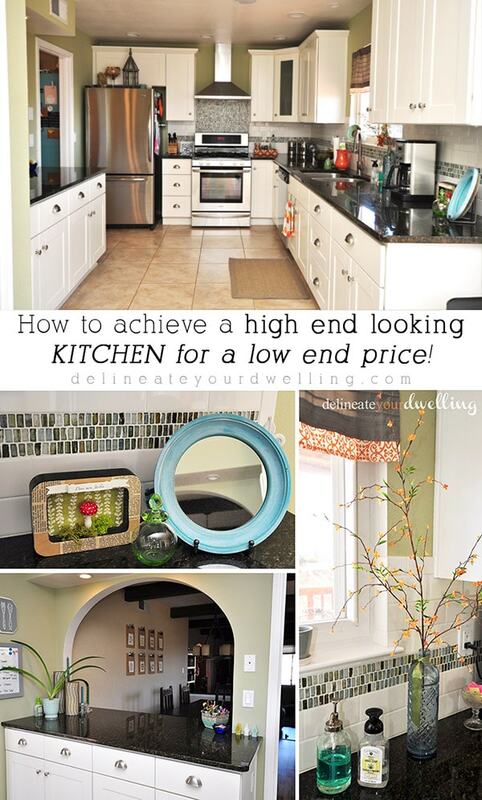 We are in the planning stages of redoing our kitchen on a budget, so this is very helpful. My favorite place to buy appliances is Sears Outlet-they sell brand new stuff at a true fraction of retail. Thanks for sharing at Fridays Unfolded! wow so pretty. love that backsplash! Thanks so much for sharing and featuring you tomorrow on the blog- thanks for linking up at creativity unleashed and hope to see you back! WOW this is fantastic! I love the tile, maybe one day I will get around to this! Thanks for linking it up to Cook It! Craft It! Share It! I hope to see you back next week! I’ve had fun seeing these posts on your kitchen. You guys did an amazing job! Thanks for giving encouragement that anyone can do this! I’ll be featuring this at the next Frugal Crafty Home Blog Hop on this Sunday night! It looks so great! Great advise. And I just love the cabinets with the backsplash. And counter. And appliances. I guess I love everything! Gorgeous remodel of your kitchen! Yes, it really is possible to do it for a lot less than those HGTV $65,000 makeovers! 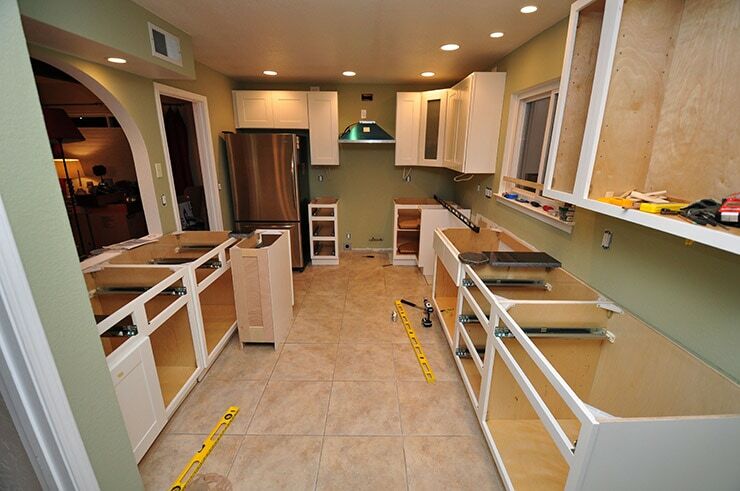 We spread our remodel over a couple of years and I’ll be sharing the after pictures soon on my blog. Doesn’t it feel good to say, “I did it myself”? Yay you! Wow, your kitchen looks really amazing! Y’all did a wonderful job. I really like the backsplash. Looks AMAZING! I came over from the Be.You.tiful link-up and I am so impressed with your kitchen! 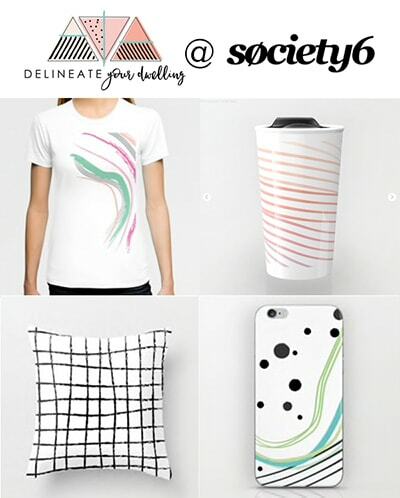 And, your blog design. 🙂 I pinned your kitchen! I love all the pictures, great makeover!! Your kitchen is lovely, Amy, and I love the glass tiles on the backsplash. What a beautiful kitchen you have as a result of your hard work. Visiting from Eat. Create. Party. Have a great Easter weekend. Your kitchen makes me so happy!!!!! Love the colors! And I agree, nothing saves more mula than doing it yourself!! A whole new kitchen is a huge job, yours looks amazing. Great post. That looks great! We have been slowly finishing our kitchen too. You can save so much if you just take your time and like you said, be patient.